Nestled in northeastern Wisconsin’s beautiful Kewaunee and Door Counties is a unique multi-use trail system. Hikers, bikers, horses and snowmobilers happily share 30 miles of well-groomed trails maintained by the non-profit organization, Friends of the Ahnapee Trail, in partnership with snowmobile clubs, two county governments and the Wisconsin Department of Natural Resources. The Ahnapee State Trail is built on an eight to ten foot wide limestone covered railroad bed that stretches from Algoma north to Sturgeon Bay and west to Casco. The trail is open year round and there is no fee for its use. Maintenance of the trail is funded by and provided through a combination of private donations, memberships, volunteer groups, local government contributions, and state fuel tax dollars. The Ahnapee trail got its start as a railway route for the Ahnapee & Western Railroad. When financial woes forced the railroad to abandon this line in the early 1970’s, the state of Wisconsin stepped in. The state was faced with selling the land to private landowners or converting the railway into a trail system for public use. Without adequate state funds to develop and maintain the trails, private sale seemed likely. Worry over private purchase of the land prompted a very small group of concerned individuals to form the “Friends of the Ahnapee Trail” in 1988 to protect this valuable asset for public use. The result of their efforts is a multi-use trail system financially supported by almost 250 contributors and memberships, and the State of Wisconsin taxpayers. It is maintained by a team of many volunteers, user groups and two counties. Special projects, such as bridge construction, are supported through private and state grant funding with matched endowments and private contributions. Construction is performed by volunteers and professional contractors in cooperation with Wisconsin’s Department of Natural Resources. Maintaining 30 miles of trails with no staff, no equipment, and a very limited budget, “Friends” relies on a highly organized volunteer program that utilizes major user groups and county equipment and employees. In the summer months, various equine groups help monitor trail conditions and maintain the trails while the county provides brush removal and mowing. During the winter, local snowmobile clubs provide the equipment and volunteers necessary to groom trails for their preferred sport. User groups see it in their own best interest to co-operate to help groom and maintain their beloved trail system. Volunteers are of key importance to “Friends” success. Serving on Ahnapee’s Board of Directors are representatives from all major user groups. Fifty percent are hikers, approximately one third have equine interests, and the remaining percentages represent bikers and snowmobilers. A variety of equine groups are actively involved with “Friends” including those from 4-H clubs, natural horsemanship disciplines, therapeutic riding groups and carriage, wagon and cart drivers. In addition to developing and maintaining the trail system, another mission of “Friends” is to promote its public use by sponsoring special events, hands-on projects and community programs throughout the year. The Ahnapee Trail Family Day is its most popular all-day event involving the whole community. It is held each spring at the trailside Ahnapee River Trails Campground. A nominal sum per family is charged for entrance to the ‘staging event’ area. Some of the horse-related activities for the day include free wagon rides pulled by several Belgian teams and free pony rides in a round pen for the children. The Friends sell bike helmets to promote bike safety. Helmets are sold below cost through sponsorship of the International Center for Injury Prevention. Free bike tune-ups have been offered by a local bike shop. Controllable kite flying was demonstrated this year by the local kite flying club. A concession stand staffed by Friends offers hot dogs, burgers, brats, and donated soda to raise money for trail development and maintenance. Funds are also raised through a raffle which this year included donations from twenty-nine local businesses and individuals. Maps and courtesy rules are distributed to educate the public on Ahnapee’s multiple uses and points of interest. A favorite of the kids is an aerial drop of candy donated by a local flying group. The family trail day concludes with a big bonfire and music provided gratis by local entertainers. The Ahnapee trail is used by local equine groups for their own fund-raising events, as well as for educational and recreational activities. A trailside livery and training stable offers trail rides and overnight boarding. Parking for horse trailers is available at a county park and at the Sturgeon Bay end of the trail for the convenience of out-of-town visitors. An additional trailside parking lot will open this fall and campgrounds are available at Algoma on the Ahnapee River. 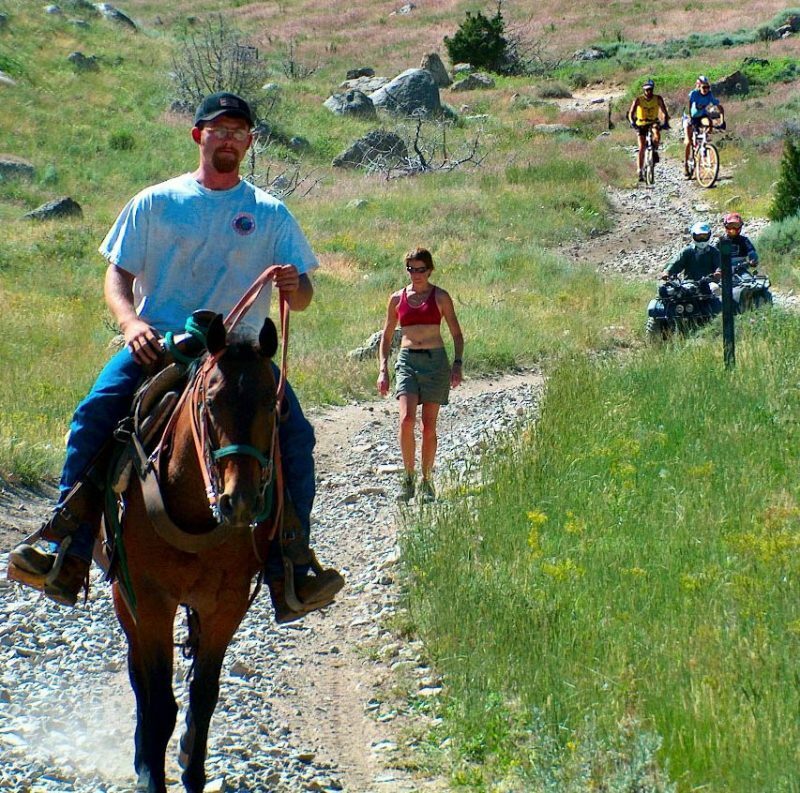 Safety and courtesy are two very important goals of “Friends.” Teaching the public to respect other trail users, especially those of the equine variety, is an ongoing educational concern of the organization. “Friends” prints and distributes guidelines for trail use, and offers safety tips for encountering horses while on the trail. Visitors are asked to pitch in to keep the trails clean by removing their garbage, and by disposing of the waste products from their dogs and horses. All dogs must be leashed. Helping visitors to stay safe while enjoying the trails is absolutely necessary in order for Ahnapee’s multiple uses to work. Today the major focus for “Friends” is on the development and expansion of its parking facilities. Working with the Department of Natural Resources, negotiations are also underway with the Canadian National Railroad to acquire an additional 20 miles of abandoned railroad bed to add to the current trail system. “Friends” relies on the contributions, participation and involvement of its sponsors to maintain and improve the Ahnapee trail system. A tax-exempt organization, “Friends” is dedicated to showcasing the natural beauty of Northeast Wisconsin and the Door County peninsula in all its seasons. For more information about the trail or the organization, contact Friends of the Ahnapee at PO Box 93, Algoma, WI 54201-0093 or call (920) 487-3822. Or you can visit the Ahnapee State Trail’s website at www.ahnapeetrail.org.